Gabby Giffords: "Be Bold. Be Courageous. 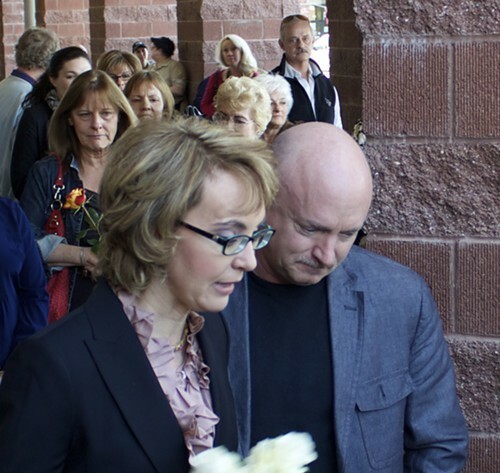 Support Background Checks"
Gabby Giffords returned today to the Safeway parking lot where a gunman shot her through the head two years ago to urge the U.S. Senate to take action on legislation requiring background checks. Giffords, Kelly and several of the other victims and survivors of the Jan. 8, 2011, shooting massacre gathered this afternoon to encourage Arizonans to ask Sens. John McCain and Jeff Flake to support expanding background checks. The Senate Judiciary Committee is scheduled to mark up a background-check bill tomorrow, but Politico reported this afternoon that a bipartisan effort to craft a bill had fallen apart over differences regarding whether non-licensed sellers would have to keep records of firearm transactions. As Giffords and Kelly arrived at the Safeway this morning, they laid a bouquet of white flowers at the memorial for the six people who were killed during the Tucson rampage: 9-year-old Christina-Taylor Green, federal Judge John M. Roll, Giffords aide Gabe Zimmerman and retirees Dorothy Morris, Phyllis Schneck and Dorwan Stoddard. Kelly, with Giffords by his side, then took to the podium to call on the public to contact McCain and Flake to let them know they should support new laws that would expand background checks to gun sales by unlicensed dealers and to make it easier to block sales to mentally ill people who pose a danger to themselves or others. Kelly pointed out that the Tucson shooter had a history of run-ins with authorities as a result of his deteriorating mental state. Kelly noted that McCain and Flake had both said in recent weeks that they supported some form of legislation that would expand the use of background checks to keep guns out of the hands of criminals and the mentally ill, but the political debate remains complex. Emily Nottingham, the mother of slain Giffords aide Gabe Zimmerman, said it was difficult to be at the Safeway. Pam Simon, a former aide to Giffords who was among the 13 people wounded on Jan. 8, 2011, remembered pulling into the parking lot on a sunny but chilly morning and buying a pair of gloves for Giffords. Susie Hileman, the neighbor who brought Christina-Taylor Green to the event, said she remembers imagining “the sparks that were going to fly” when Christina-Taylor—an aspiring politician at Mesa Verde Elementary School—shook hands with Giffords. Hileman expressed frustration with the political excuses for not moving forward with restrictions on guns. Ken Dorushka, who was shot while shielding his wife during the Tucson rampage, said the Second Amendment, like the other amendments to the U.S. Constitution, has limits. The press conference, which drew national attention, was another step toward ratcheting up public pressure for new guns laws. Giffords and Kelly have formed Americans for Responsible Solution, a political-action committee that also began running TV ads in key states, including Arizona. Kelly promised that the public would see more of Gabby Giffords in the future.